Digital tooth shade matching provides consistent shade matching for restorations, ensuring that the shading of our restorations most closely match our patients’ teeth. Standardized measurements of the hue, value and color of the patient’s teeth are recorded and then shared with our dental lab to help provide the most accurate information for matching restorations. Telescopic loupes are specialized glasses with powerful magnifiers attached that allow Dr. Papageorgiou to get a detailed look at the work he is doing during all phases of treatment, allowing him to work with great precision and to see small details. With this latest technology, a UV light detects cavities that are not yet visible to the naked eye. DiagnoDent® enables dentists to practice minimally invasive dentistry by providing a better possibility of diagnosing this disease at an early stage. Oral cancer affects thousands of Americans yearly. 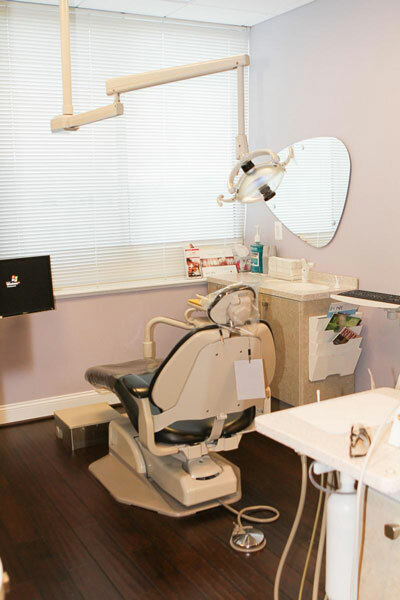 We use the latest technology to detect changes in oral tissue consistencies and/or lesions. Dr. Papageorgiou shines a UV light into the mouth to detect unhealthy tissue. Healthy tissue looks lighter under the light while spots of bad tissue appear dark. With early detection, cancer may be caught before it has time to spread, potentially saving lives. Our automated appointment reminder will contact you approximately two days prior to your scheduled appointment. After listening to the message, please enter “1” to confirm and “2” to cancel. If no response is recorded, one of our friendly team members will give you a call to follow up. If there is no answer at the number provided, the appointment reminder will leave a voicemail message. It is your responsibility to let us know if you need to cancel and failure to notify the office of a cancellation may result in a charge.